Beginning this review with such title I anticipated that not all readers will agree with me. 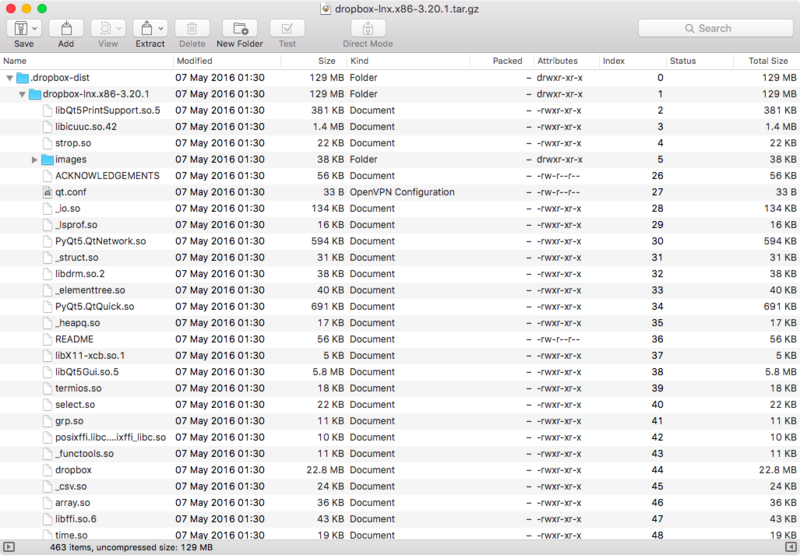 Mac Appstore is teeming with apps working with archives, so why BetterZip is the only one? Let me try and explain my point of view. Possibility to archive and extract all common archive formats. From among “desktop” ones are ZIP, RAR and 7Z. Preferably with possibility to create archives of less common GZip and BZip. A single ZIP format available in the built-in archiver is not enough anymore. Sometimes one has to work with RAR archives which are used on servers for incremental file backups. Viewing archive contents without need to extract, as well as files update in archive. This is now a de-facto standard for archivers to which many are used working with WinZip and WinRAR. It is not convenient at all to work without this feature. Integration in Finder context menu. First of all – archiving selected files from context menu. Flexible archive creation settings and compatibility of archives with Windows. This includes archive profiles and ignoring service files and folders of OS X (have you seen how an archive created with built-in Windows utilities looks like?). App design. Here I become a real nerd when I pick on the design of apps for Mac and their icons. I admire OS X for its unique design and convenience, and I cannot stand programs which look like an echo form the 90s. Perhaps this point is not critical to everyone, but I am sure that I am not alone here. App support. Personally I barely use apps, latest version of which was released 5 years ago. Keka – weird icon design which is difficult to relate to files; archive contents cannot be viewed; latest version in AppStore – end of 2013. Archiver – archive contents cannot be viewed; latest update – end of 2015; inadequate price. Smart Zipper Pro – wonderful archiver that meets all criteria except for latest release date – no updates for over a year and a half. All other programs are either ugly outside or way too old inside. Virtually the only one archiver for Mac available on the software market which meets all criteria is BetterZip. It works with all popular archive formats, integrates into Finder, including Quick Look, it is regularly updated and its price is reasonable. In 2015 it was removed from AppStore for noncompliance with Apple’s requirements, and its developer sacrificed this privilege in favor of app’s functionality, which was mentioned in his blog. As of today, this program is available only on website at $19.95 which is quite reasonable for such utilities. Contents viewing window of BetterZip reminds WinRAR. You can quickly check your files in the right side panel and navigate through folders in the left part. BetterZip has the so-called Direct Mode – saving changed files in archive without confirmation. 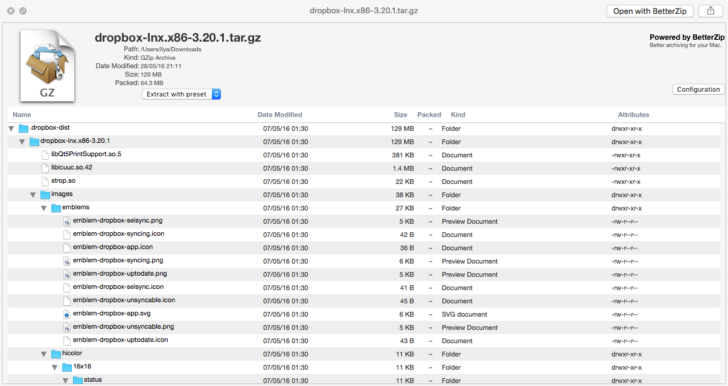 Another peculiar feature of BetterZip – Quick Look Generator. You can view contents from any archive by pressing Space on selected file. BetterZip can compress and decompress files in ZIP and 7-Zip formats, and by using rar by RarLab console utility you can work with RAR archives too. 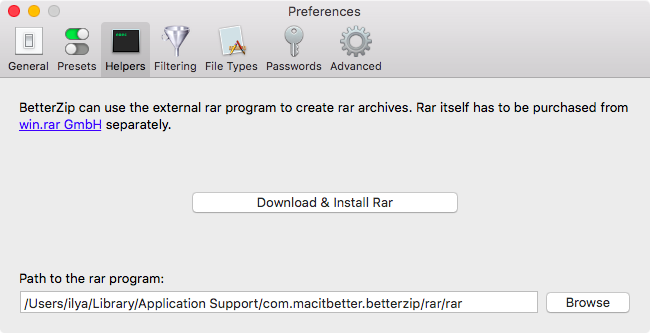 All you need is to open preferences and press “Download & Install Rar”. BetterZip will download it and save into its service catalog. The console will not open while working with RAR archives. 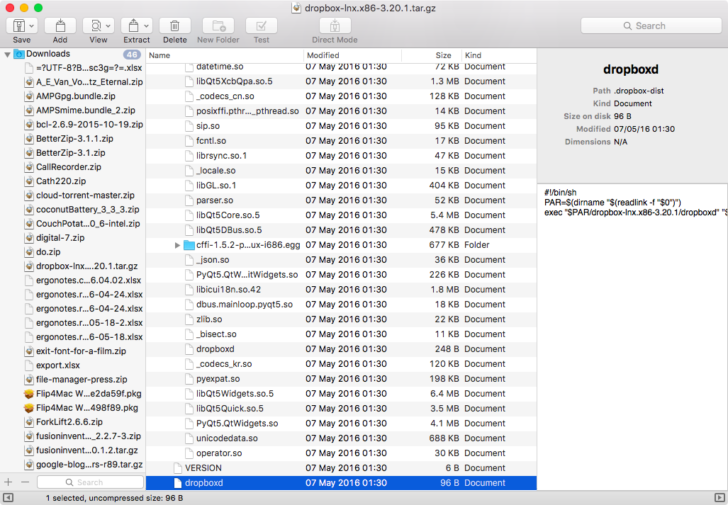 Presets for saving and extracting archives in BetterZip are kept in special profiles any of which can be assigned by default to be used in Finder context menu or inside the program itself. Apart from archive format and compression rate in archiving profile you can set up encryption, run scripts, and exclude patterns, as well as remove OS X specific stuff from archives. Archive extraction preferences contain less options but can be useful and convenient too. 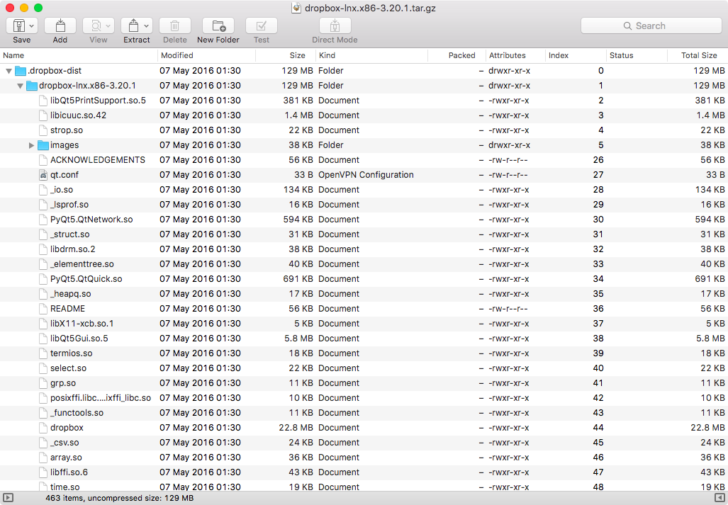 When archiving files from Finder you will see a window with confirmation of parameters. In the end I would describe BetterZip in three words: powerful, convenient and elegant. I don’t even want to try out anything else after I’ve seen it, although there’s nothing to choose from. My impression was that the developers of BetterZip, having created something very similar to WinRAR, took example from Eltima which released Total Commander replacement- file manager Commander One. What’s missing in BetterZip is Automator library. I would be great to be able to automate the process of creating and extracting archives. Reminder: you can download BetterZip from official website. You can also use demo version. Its price as of today is – $19.95. Special thank you to Robert Rezabek for providing BetterZip license.